I bet we can see a giraffe or maybe a tiger... why not both? 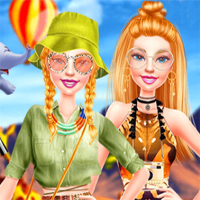 Join Ellie in this amazing and exotic new game called Ellie Safari Adventure and help her pick the best outfits to fit her journey. Make sure you have an amazing time playing this new dress-up game! Enjoy!